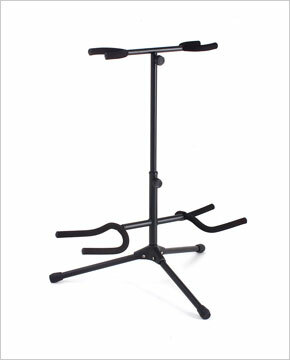 Easy transport and storage double guitar stand for aspiring guitar player. Holds two guitars securely. Stable with one guitar too. Welded extension tubes for cradles and all removable components are keyed for easy and secure assembly. Stamped metal hub for long life. Convenient handle for moving included on top. Satin rubber cushions for protection. Folds for transport and storage.